The Sidrón Cave (Spanish: Cueva del Sidrón) is a non-carboniferous limestone karst cave system located in the Piloña municipality of Asturias, northwestern Spain, where Paleolithic rock art and the fossils of more than a dozen Neanderthals were found. Declared a "Partial Natural Reserve" in 1995, the site also serves as a retreat for five species of bats and is the place of discovery of two species of Coleoptera (beetles). The total length of this huge complex is approximately 3,700 m (12,100 ft), which contains a central hall of 200 m (660 ft) length and the Neanderthal fossil site, called the Ossuary Gallery, which is 28 m (92 ft) long and 12 m (39 ft) wide. In 1994, human remains were found accidentally in the cave. 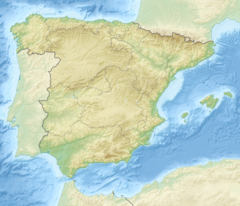 They were initially suspected to be from the Spanish Civil War because Republican fighters used to hide there; however, later analysis shows that the remains actually belong to Neanderthals. The primary gallery of interest at Sidrón Cave is the Ossuary Gallery or Tunnel of Bones (Galería del Osario), where the remains of several Neanderthals were found. The Galería del Osario was excavated from 2000 to 2013. The Neanderthal remains were all recovered from a single layer, Stratum III. The associated archaeological assemblage consists of 53 stone tools; nonhuman bones are very scarce. The only other species present of similar size is red deer. The remains of a few small mammals and gastropods were also found. Researchers recovered more than 2500 hominin fossil elements from the site. The minimum number of individuals from Sidrón Cave is 13. The age of these remains of three men, three adolescent boys, four women, and three infants has been estimated to about 49,000 years. The fact that the bones are excellently preserved with very limited erosion and no large carnivore tooth marks and the unusual deposition of the bones, mixed into a jumble of gravel and mud, suggests that these Neanderthals did not die in this spot but an exterior location. A number of scenarios of how these "members of an extended family" might have ended up in a 6 m2 (65 sq ft) room-sized space, dubbed the Tunnel of Bones included flooding, cave collapse, and disposal by cannibals. Evidence for cannibalism includes "the presence of cut marks, flakes, percussion pitting, conchoidal scars, and adhering flakes". Projection exists that they were dropped into the cave in a single event via a collapse of nearby fissures above the site or, by influx of storm water. Morphologically, the El Sidrón humans show a large number of Neanderthal lineage-derived features even though certain traits place the sample at the limits of Neanderthal variation. Integrating the El Sidrón human mandibles into the larger Neanderthal sample reveals a north–south geographic patterning. The cave is in the northern portion, southern Neanderthals show broader faces with increased lower facial heights. The relatively well-preserved specimen of a juvenile Neanderthal recovered from the Galería del Osario, El Sidrón J1, allowed researchers to study the ontogeny of Neanderthals. By analyzing its dentition, researchers estimate that El Sidrón J1 was between 7 and 8 years old at the time of death. Around 36% of the juvenile specimen's remains was recovered, including key cranial, dental and vertebral column elements. 138 fossil elements were recovered, including 30 dental elements and a complete mandible. Based on the robustness of the specimen, researchers guess that the specimen was likely male. El Sidrón J1 exhibits many traits of delayed maturation. At the time of death, El Sidrón J1's brain was likely not yet fully developed. El Sidrón J1's estimated cranial capacity is 1,330 cm3 (81 cu in), which is around 87% of the average adult Neanderthal cranial capacity (1,520 cm3 (93 cu in)). At a comparable age, typical modern human juveniles reach around 95% of the average adult human cranial capacity. Additionally, the juvenile specimen exhibits an unusual developmental feature; the neurocentral synchondrosis between his thoracic and C1 vertebrae had not yet fused; typically, this fusion occurs around 2 years earlier in modern humans. Ancient Neanderthal mtDNA was partially sequenced in HVR region for three distinct Neanderthals from El Sidrón cave (441, 1253, and 1351c). Researchers also sequenced the partial nuclear genomes from several individuals from the cave. 1253 and 1351c have the same mutations at position A-911, G-977 in exon 7 of FOXP2 gene, known as the "language gene", as found in present-day humans. The first sequencing of the Neanderthal Y chromosome was successfully completed from a specimen from Sidrón Cave. Based on this sample, researchers estimate that Neanderthals diverged from the common human ancestor around 590,000 years ago. The Sidrón Cave Y chromosome had never been identified before from other fossil hominin specimens and is not found in modern humans. The Sidrón Cave Y chromosome coded for several minor histocompatibility antigen genes that differ from that of modern humans. Recent research investigating the Neanderthals remains recovered from El Sidrón have provided evidence that their diet would have consisted primarily of pine nuts, moss and mushrooms. This is contrasted by evidence from other European locations which point to a more carnivorous diet. ^ "Traces of the first inhabitants of Asturias have been found in this Partial Nature Reserve". turismoasturias es. Retrieved December 27, 2016. ^ "El Sidrón Site - Biology Online". Biology Online. 2007-11-13. Retrieved 2010-12-21. ^ a b c Zimmer, Carl (2010-12-21). "Bones at El Sidrón Give Glimpse Into Life of Neanderthals". The New York Times. Retrieved 2017-09-22. ^ a b c d e f Rosas, Antonio; Ríos, Luis; Estalrrich, Almudena; Liversidge, Helen; García-Tabernero, Antonio; Huguet, Rosa; Cardoso, Hugo; Bastir, Markus; Lalueza-Fox, Carles; de la Rasilla, Marco; Dean, Christopher (2017). "The growth pattern of Neandertals, reconstructed from a juvenile skeleton from El Sidrón (Spain)". Science. 357 (6357): 1282–1287. doi:10.1126/science.aan6463. ISSN 0036-8075. ^ "Paleobiology and comparative morphology of a late Neandertal sample from El Sidrón, Asturias, Spain". Pnas org. 103 (51): 19266–19271. doi:10.1073/pnas.0609662104. PMC 1748215. Retrieved December 26, 2016. ^ Rosas, Antonio; et al. (2006-12-19). "Paleobiology and comparative morphology of a late Neandertal sample from El Sidrón, Asturias, Spain". Proceedings of the National Academy of Sciences. pp. 19266–19271. ^ "Scientists provide a more accurate age for the El Sidrón cave Neanderthals --". ScienceDaily. Retrieved December 26, 2016. ^ "El Sidron - Evidence for Neanderthal Cannibalism". Archaeology about com. Retrieved December 26, 2016. ^ "Samples". Canadian archaeology ca. Retrieved December 27, 2016. ^ Estalrrich, Almudena; Rosas, Antonio (2013). "Handedness in Neandertals from the El Sidrón (Asturias, Spain): Evidence from Instrumental Striations with Ontogenetic Inferences". PLoS ONE. 8 (5): e62797. doi:10.1371/journal.pone.0062797. PMC 3646041. PMID 23671635. Retrieved December 26, 2016. ^ "Neandertals have the same mutations in FOXP2, the language gene, as modern humans &laquo". Anthropology.net. Retrieved 2008-11-06. ^ Lalueza-Fox; et al. (January 2005). "Neandertal Evolutionary Genetics: Mitochondrial DNA Data from the Iberian Peninsula". Molecular Biology and Evolution. 22 (4): 1077–1081. doi:10.1093/molbev/msi094. ^ Lalueza-Fox, Carles; Rosas, Antonio; Rasilla, Marco de la (2012). "Palaeogenetic research at the El Sidrón Neanderthal site". Annals of Anatomy - Anatomischer Anzeiger. 194 (1): 133–137. doi:10.1016/j.aanat.2011.01.014. ISSN 0940-9602. ^ Slon, Viviane; Hopfe, Charlotte; Weiß, Clemens L.; Mafessoni, Fabrizio; de la Rasilla, Marco; Lalueza-Fox, Carles; Rosas, Antonio; Soressi, Marie; Knul, Monika V.; Miller, Rebecca; Stewart, John R.; Derevianko, Anatoly P.; Jacobs, Zenobia; Li, Bo; Roberts, Richard G.; Shunkov, Michael V.; de Lumley, Henry; Perrenoud, Christian; Gušić, Ivan; Kućan, Željko; Rudan, Pavao; Aximu-Petri, Ayinuer; Essel, Elena; Nagel, Sarah; Nickel, Birgit; Schmidt, Anna; Prüfer, Kay; Kelso, Janet; Burbano, Hernán A.; Pääbo, Svante; Meyer, Matthias (2017). "Neandertal and Denisovan DNA from Pleistocene sediments". Science: eaam9695. doi:10.1126/science.aam9695. ISSN 0036-8075. ^ a b c d Mendez, Fernando L. (April 7, 2016). "The Divergence of Neandertal and Modern Human Y Chromosomes". The American Journal of Human Genetics. 98 (4): 728–734. doi:10.1016/j.ajhg.2016.02.023. PMC 4833433. PMID 27058445. ^ Weyrich, Laura S.; Duchene, Sebastian; Soubrier, Julien; Arriola, Luis; Llamas, Bastien; Breen, James; Morris, Alan G.; Alt, Kurt W.; Caramelli, David; Dresely, Veit; Farrell, Milly; Farrer, Andrew G.; Francken, Michael; Gully, Neville; Haak, Wolfgang; Hardy, Karen; Harvati, Katerina; Held, Petra; Holmes, Edward C.; Kaidonis, John; Lalueza-Fox, Carles; de la Rasilla, Marco; Rosas, Antonio; Semal, Patrick; Soltysiak, Arkadiusz; Townsend, Grant; Usai, Donatella; Wahl, Joachim; Huson, Daniel H.; et al. (2017). "Neanderthal behaviour, diet, and disease inferred from ancient DNA in dental calculus". Nature. 544 (7650): 357–361. doi:10.1038/nature21674. hdl:10261/152016. PMID 28273061. This page was last edited on 28 February 2019, at 21:34 (UTC).